I get a lot of questions when I teach classes about my written patterns and how I illustrate the steps, so I thought I would do a quick write up about it here. Quick warning: I am not a professional illustrator and definitely consider myself a beginner. The more I write patterns, the more the illustrations improve, but I am certainly not an expert. The software that I use is Inkscape, which is a wonderful tool for creating vector illustrations. Even more importantly – it absolutely free. 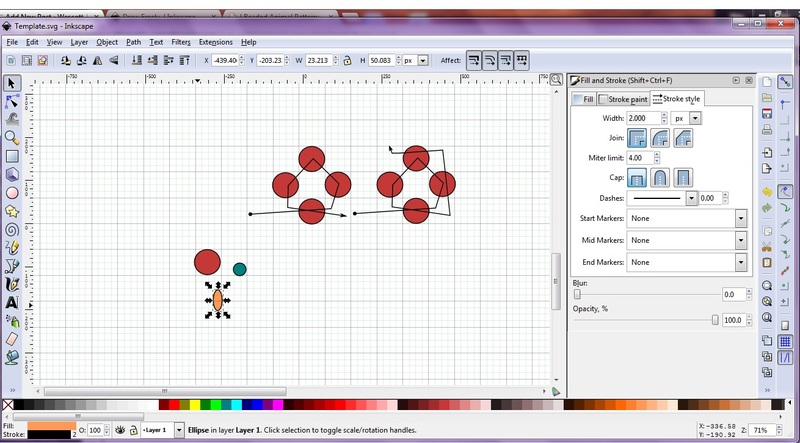 You can download Inkscape for Windows, Mac OS, and even Linux. Just click on the Download tab and choose your operating system. It’s not piracy because the creators have chosen to make it available to the public, so don’t worry about illegally downloading anything. The link is legal and safe. You can download Inkscape here. Once you download Inkscape, don’t be overwhelmed by the amount of tools and buttons. There is a lot that you can do, yes, but I personally only use two or three tools for my patterns. I learned how to use Inkscape from a wonderful beader who wrote a tutorial about how to use Inkscape specifically for writing beading patterns. It’s a long tutorial (about six pages), but she’ll show you how to get Inkscape all set up for beading designs and will walk you through the project step by step and in great detail. I usually make my illustrations in Inkscape and then just copy and paste them into a Word document, where I write my instructions and add labels to the pictures. This is what the screen looks like after you get your template set like the tutorial. It’s easy enough software to use, with a bit of practice (and that tutorial is very detailed). Hope this helps any prospective designers out there! Now get those creative juices flowing and start writing patterns! This entry was posted in Tips and Tricks and tagged illustration, patterns, software, writing. Bookmark the permalink.